As Andy Williams says, It´s the most wonderful time of the year…"
Celebrate Christmas aboard the 52-foot catamaran SHANGRI LA and have an unforgettable holiday. Shangri-La creates memories you will never forget! So pack your swimsuits and flip flops and come celebrate Christmas aboard with Bernd & Daniela. 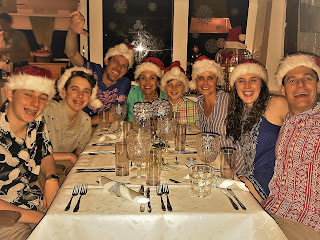 They have a New Year's charter beginning on December 28th so they are available for your Christmas charter through the 26th or December 27th, whichever is best for you. Guest cabins: Standard arrangement is 3 cabins with Queen berths and 1 cabin with single bunks. The single berths are suitable for adults with a length of 6'8". All cabins have ensuite, private head with electric-flush toilet, sink, and large stall shower. Four Queen cabins are available on request (crew will relocate) with a supplement (inquire). Children: No minimum age. Crew loves having families aboard. 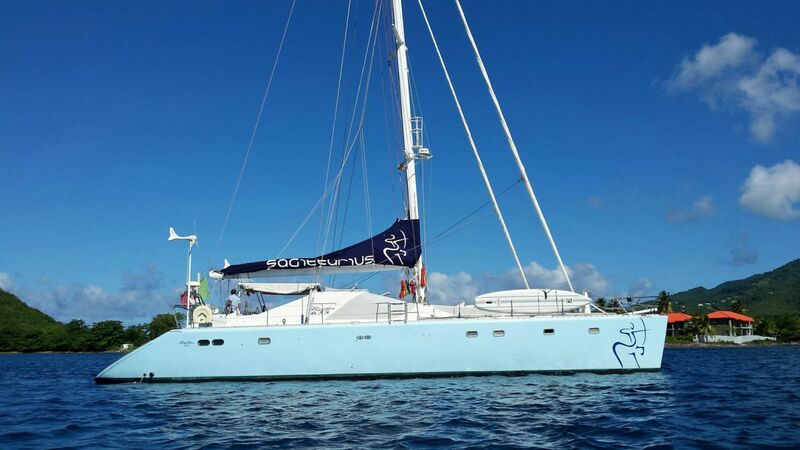 We would like to welcome Oui Cherie, a 52-foot Lagoon catamaran, to the Virgin Island yacht charter fleet. 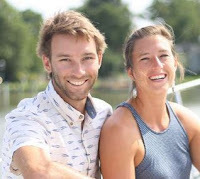 Ryan and Jill are an energetic, enthusiastic, and experienced crew ready to treat guests to fun, memorable vacations. 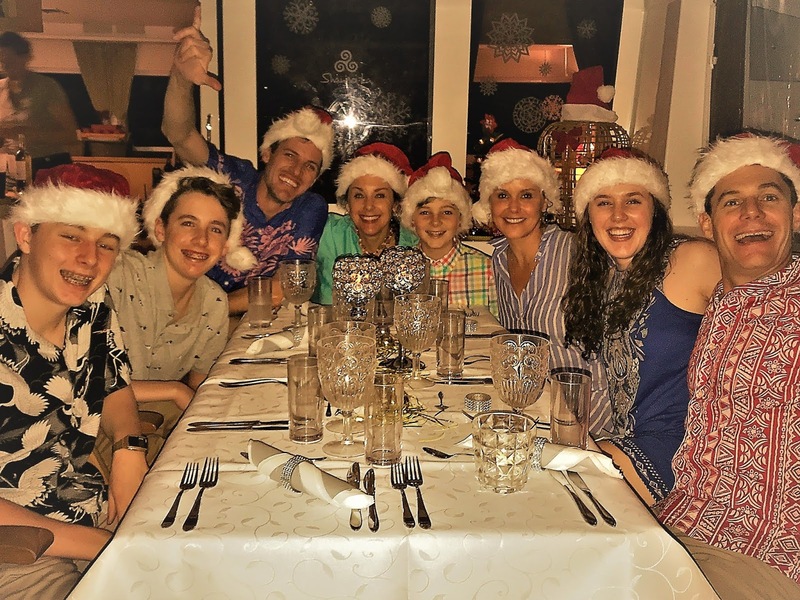 They have transformed their love for having fun above and below the water into a great vacation package for active groups, families and those wanting to get the most out of their trip. Both Ryan and Jill are Dive Masters. Jill is also a yoga instructor and loves to teach paddle board yoga. 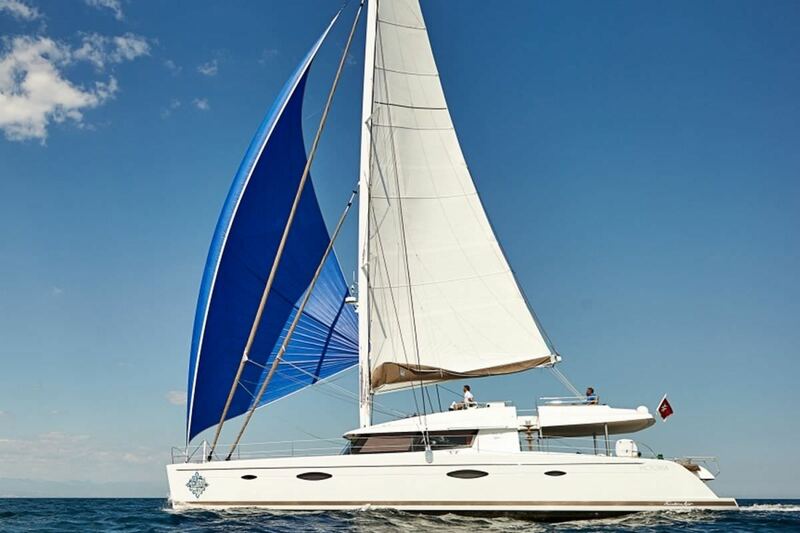 The charter catamaran Elysium, a 62-foot Privilege with a crew of two, has a special offer for this 2018 summer season. 15% off for any 7-night charter booked and taking place in July & August 2018. Depending on dates, charters may take place either in the VI or St. Maarten area. 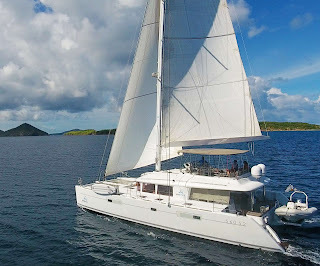 Elysium is a 62-foot Privilege catamaran with a crew of two, Dirk and Nina-Sue. Elysium has a flybridge, is fully air conditioned and accommodates up to 6 guests in 3 cabins each with private, ensuite head/shower. Inquire about the possibility of a 7th guest in the forward port forepaw cabin. Each cabin has an iPod dock and DVD player. The master cabin is forward port & center and has a centerline King berth. The other two guest cabins are located aft and also have King berths. Elysium has a 15-foot dinghy with 70HP motor, adult waterskis, tube, wakeboard, kneeboard, 2 standup paddleboards (SUPs), 2-person kayak, snorkel gear, fishing equipment, DirectTV, beanbag chairs, TV in salon, wifi internet where available, etc. Dirk is a Dive Master and up to 5 dives/wk and gear are included for certified divers. The charter yacht White House is a 50-foot Lagoon catamaran with a crew of two and accommodations for up to 4 guests. 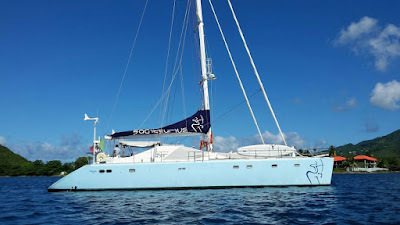 Above is a photo of catamaran White House moored off the Indians in the British Virgin Islands. The Indians are an uninhabited small archipelago of islets in the British Virgin Islands in the Caribbean. They are located south of Tortola and east of Saint John. You can see Tortola in the background. 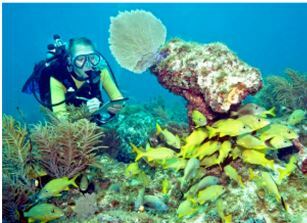 The Indians are also the second most popular dive site in the British Virgin Islands after the wreck of the RMS Rhone. The shallower areas of the Indians are also a popular snorkelling venue. White House is a 50-foot Lagoon catamaran with a crew of two. 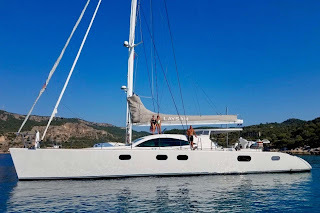 This catamaran is fully air conditioned and has several exterior lounging areas: flybridge, aft cockpit, forward seating area. White House accommodates up to 4 guests in 2 Queen cabins, each with private, ensuite head (electric-flush toilet and stall shower). This is an "owner's version" so the entire starboard hull is one guest cabin with seating, desk, etc. White House has a 14-foot dinghy with 40HP motor, waterskis for kids and adults, tube, wakeboard, 2 standup paddleboards (SUPs), 2-person kayak, snorkel gear, fishing equipment, underwater camera, beach games, TV/DVD in salon, iPod dock, onboard wifi where available, etc. White House has a Dive Instructor and offers 3 dives/wk for certified divers. Includes gear. Additional dives are available at $25/diver/dive. They say that breakfast is the most important meal of the day. Here's an example of what you may have aboard the 56-foot, 8-passenger Lagoon catamaran, Playtime. 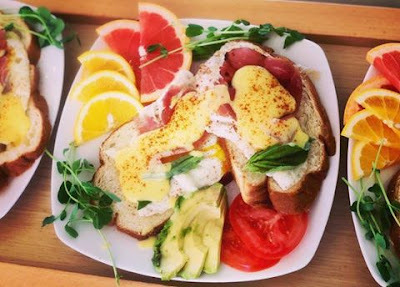 Here we are having open faced crostini with fresh garden tomatoes, avocado, prosciutto, sweet pea micro greens, AND some of Playtime’s own home grown basil topped with warm, smoked paprika hollandaise. See Playtime's brochure to view their sample menus. Still open for Thanksgiving and Christmas. Available dates: November 14 to December 28, 2018. Playtime has a special offer of a 10% discount for remaining open dates in 2018, excluding Christmas and New Years, of course. 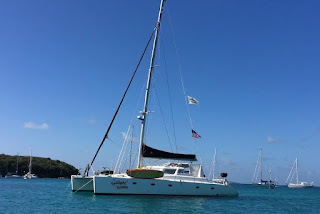 Playtime is a 56-foot Lagoon catamaran with a crew of two. Playtime is fully air conditioned and accommodates up to 8 guests (you can be a smaller group than 8) in 4 Queen cabins with walkaround berths, or you can swap one of the Queen cabins for a cabin with twin bunks if that better suits your group. Each guest cabin has a TV and a private ensuite head (shower and electric-flush toilet). Playtime's forward sitting area and skylounge, along with their spacious lounging area aft, ensures plenty of outdoor space for everyone. Amenities and toys include: 15-foot dinghy with 50HP motor, adult waterskis, tube, wakeboard, 2-person kayak, 2 standup paddleboards (SUPs), floating mats, beach games, TV/DVD in the salon, onboard wifi with internet access where available. Playtime has two dive instructors and offers 3 dives/week to certified divers, gear included. Extra dives are at a cost of $25/dive/diver. Don't you deserve a little Playtime? Book Now! Are you looking to accommodate a large group over Christmas? 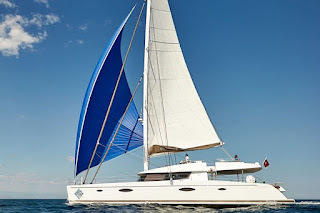 Catamarans Aoibh and Lir are available for a tandem charter at their regular 8-person rate with NO holiday surcharges. 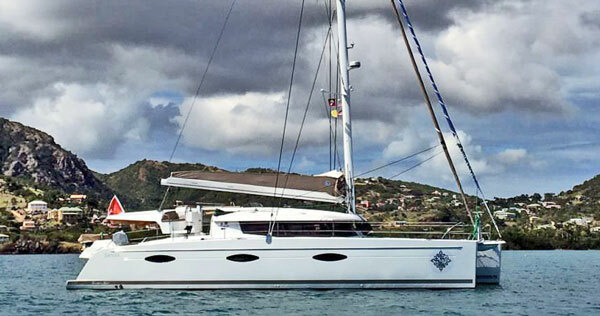 DATES: Must end by December 26, 2018 at Yacht Haven Grande marina in St Thomas, USVI. This special offer applies for a tandem charter between Aoibh & Lir only. 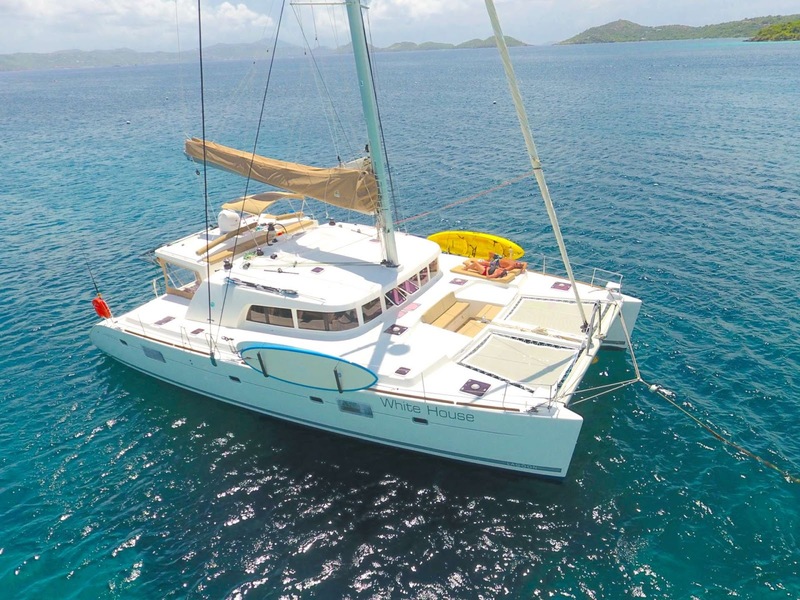 The charter catamaran PLAYTIME, a 56-foot Lagoon, has announced a $1000 across the board price drop in their standard rates. Playtime also has a special offer of a 10% discount for remaining open dates in 2018, excluding Christmas and New Years, of course. 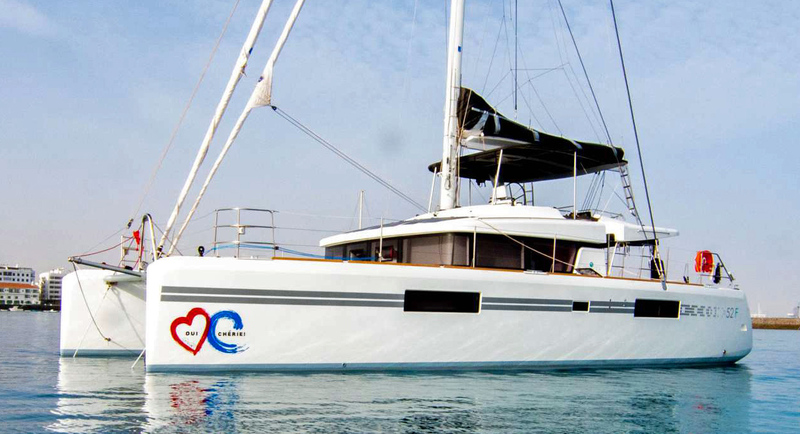 Playtime is a 56-foot Lagoon catamaran with a crew of two. Playtime is fully air conditioned and accommodates up to 8 guests in 4 Queen cabins with walkaround berths, or you can swap one of the Queen cabins for a cabin with twin bunks if that better suits your group. Each guest cabin has a TV and a private ensuite head (shower and electric-flush toilet). Playtime's forward sitting area and skylounge, along with their spacious lounging area aft, ensures plenty of outdoor space for everyone. The charter yacht Laysan is a 72-foot Serenity catamaran with a crew of 3. 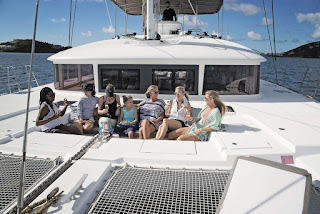 This catamaran is fully air conditioned and accommodates up to TEN guests in 5 guest cabins -- 4 Queens and 1 Twin bunks, each with ensuite bathrooms that have electric-flush toilets and shower stalls. Amenities include: a 17-foot dinghy with 70HP 4-stroke motor, waterskis for kids and adults, tube, kneeboard, wakeboard, 2 standup paddleboards (SUPs), snorkel gear, TV (50" UHD Samsung flat screen TV & Blu-ray player), iPod dock, onboard WiFi, board games, etc. For more information, pop us a quick email. 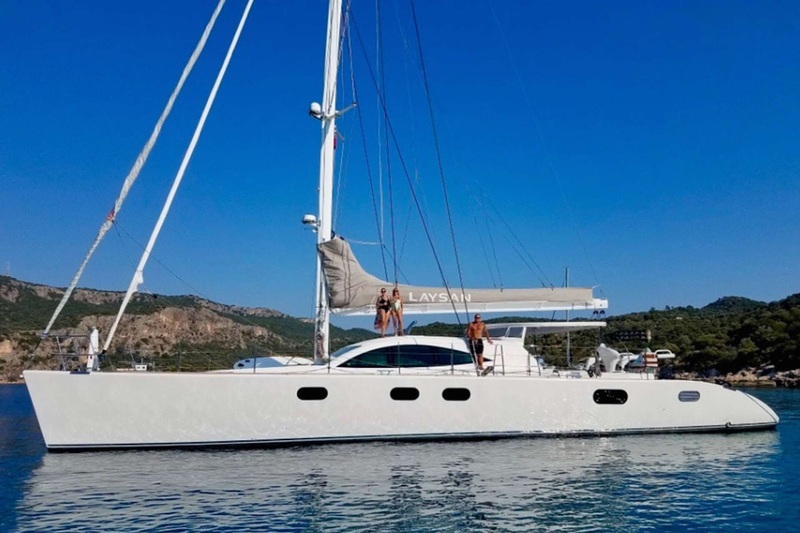 For the next 10 charters bookings, Laysan is offering a special rate of $34,000/wk for up to 8 guests, discounted from their standard price of $40,500/wk. Wow - a savings of $6,500! The 10-person special rate is $40,000. Valid any time except over Christmas & New Year weeks. Valid for 7-night charters only. Captain Will is a licensed PADI Dive Instructor and the perfect tour guide to the underwater world of the BVI. Three dives/week are included for up to 6 certified divers. Extra dives are $50/diver/dive. Diving gear can be rented locally or bring your own. Catamaran Laysan rocked the Spring BVI Charter Yacht Show! Captain Will, Chef Nicole, and Mate Remi wowed charter yacht brokers with a superb luncheon and a day sail over to the USVI. 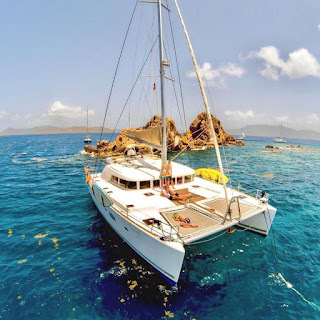 The British Virgin Islands not only has a tremendous history of pirates, lost treasures and myths, but is one of the world’s best sailing and scuba diving destinations. Its beautiful islands, beaches and safe anchorages are legendary. Divers of all levels enjoy the limitless dive sites scattered around the islands and it is nearly impossible to dive all of them, but we have compiled a list of some of the most popular and remote sites available to divers wanting to explore magical underwater reefs and historic wrecks bursting with ocean life. Just off Cooper Island, this site certainly lives up to its name. All four wrecks can be explored. Beautiful boulders and ledges, full of fish life and plenty of lobsters. Coral of all colors paint a wonderland picture - truly amazing. This famous wreck is a lovely dive, full of fish activity and great for pictures. On the north side of Little Jost Van Dyke, two underwater towers and caves full of life waiting to be discovered. Next to Peter Island is a beautiful wall full of coral, with garden eels at the bottom to say goodbye until your next dive. Known for its wreck and diving with sharks, incredible dive site located between Tortola and Anegada. So many sites to choose from and daily planning will give divers multiple options to explore. The immense deck space on Laysan makes it ideal for diving. Your private chef awaits you after every dive with mouthwatering dishes. Non-divers have multiple options to snorkel, discover sandy beaches, enjoy water sports, go on hiking trails or just relax and soak up the sun. Captain Will is a dive instructor and 3 dives/week are included for up to 6 certified divers. Extra dives are $50/diver/dive. Diving gear can be rented locally or bring your own. The charter yacht Sagittarius is a 65-foot Privilege catamaran that accommodates up to TEN guests in the Virgin Islands and the Grenadines. They have a crew of 3 for the summer season and 4 crew for the winter season. Sagittarius has a total of 5 spacious gust cabins -- 4 Queens and 1 King, each with ensuite bathrooms that have electric-flush toilets and shower stalls. Cristian Sequenzia has recently stepped into the full-time role of Captain, joined by Ilona Fricova as Mate. For winter, Chef Riccardo Lener and Stew Alexandra Sucala complete the 4-person crew. For summer a free lance chef will make up the 3-person crew. Both Cristian and Ilona have recently earned their PADI Dive Master certification. To celebrate, Sagittarius is offering FOUR FREE DIVES for all certified guests! Sagittarius has a Super Summer Special: 10 nights for the price of 7 in the Grenadines. Offer valid through September 15, 2018. 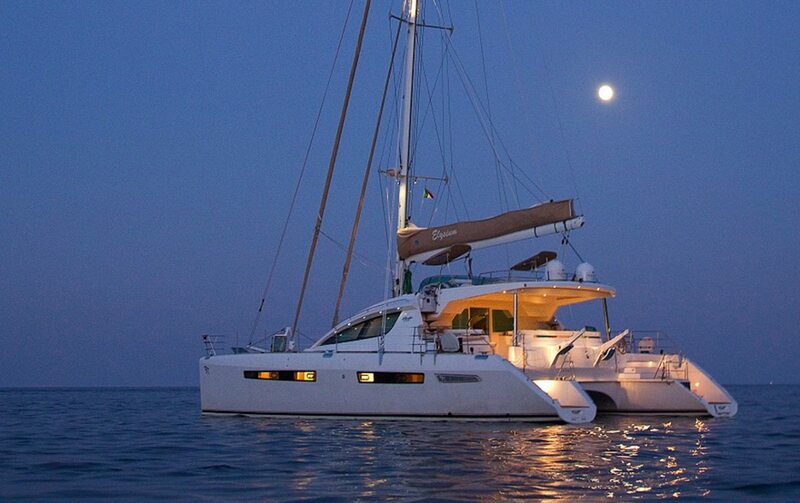 Catamaran Twilight Rodeo has a sweet summer deal for you! Fresh out of the boat yard and all fixed up from the 2017 hurricanes, Twilight Rodeo is ready to take you on a Summer adventure! That’s right... Twilight Rodeo's calendar is staying open this year, and they’re offering a sweet deal! Take $2000 off any 7-night, all-inclusive charter taken from now until October 31, 2018. They will prorate this special price for less than 7 nights, with a 4 night minimum, please. And, of course, it is requested that all charters during this time carry trip cancellation insurance. Sun, salty air, cool breezes, an awesome crew, and a fantastic boat... Twilight Rodeo is ready to give you a vacation of a lifetime. 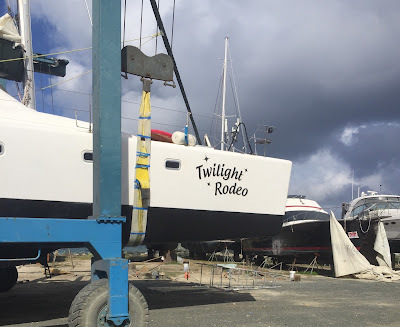 Twilight Rodeo is a 50-foot Voyage catamaran with a crew of two, Jody and Paul. Twilight Rodeo is fully air conditioned and accommodates up to 8 guests in 4 Queen cabins. The three interior guest cabins have ensuite head (electric)/shower, while the 4th Queen cabin is located forward between the hulls. This 4th cabin is only accessible from the deck and shares a head with another cabin (inquire). 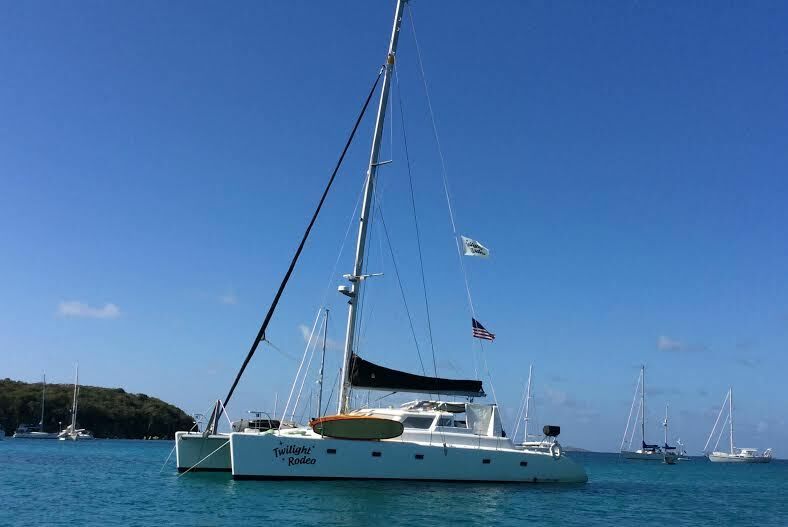 Twilight Rodeo has a 15-foot dinghy with 70HP motor, tube, wakeboard, 2-person kayak, 2 standup paddleboards (SUPs), snorkel equipment, hammock/deck swing, TV/DVD in salon, iPod dock, registered BVI fishing vessel, 6-person float mat, 4 floating noodle chairs, on board wifi in the BVIs, etc. CREW SMOKES. Paul smokes but never inside. He is discreet and mindful of non-smokers.